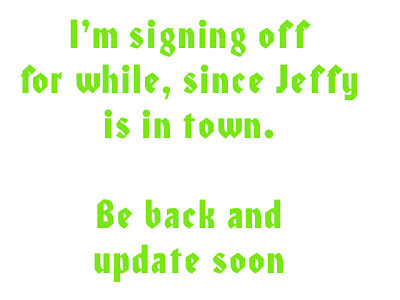 Yup, this means I will be away for weeks to be with him and spend time with him as well. Hoping that this will be a forever together.. you know what I mean. *wink*.. I'm gonna miss you all, and soon after this leave I'll make it all up to you. enjoy your long vacation with your jeffey. Yay, enjoy sweetie. I can only imagine when both of you are together. he-he-he. hello novs! I guess you are enjoying your vacation now. Hi dear, kilan ang balik mo, miss ka na namin. Konteng ingat ha, he-he. I am here again Nova. Nangungumusta lang at naglilibot sa mga links ko. Hi Sweetie, cge biya kog duaw diri pero wala nalang ko nag leave message kay nag sunod naman ni akong ngalan oi, kakahiya naman, he-he. Musta na Nova, pila ka weeks nag stay si darling nimo diha? halo day, i did jud taman sa among mga ginhawa... its really amazing when your totally beside with the man you truly love. I recently came throughout your internet site and occur to be understanding along. I assumed I might personally go away my original remark. I actually do not know what to say except that We've loved examining. Respectable internet web page. I am heading to preserve going to this weblog actually often. Interesting post. I'll have to keep it in mind, because its difficult to find such tremendous info also It'll obviously be challenging, so I can use all the help I can get..